Parkinson Voice Project is located in the Dallas suburb of Richardson, Texas. Its clinical staff specializes in the treatment of speech and voice disorders related to Parkinson’s and Parkinson’s-Plus Syndromes. The diagram to the right outlines the organization’s effective therapy program. Parkinson Voice Project is funded entirely through donations and the Pay It Forward concept. In other words, insurance is not billed, and patients are not charged for speech therapy. At the end of treatment, patients are asked to make a donation – Pay It Forward – to help the next patient receive therapy. 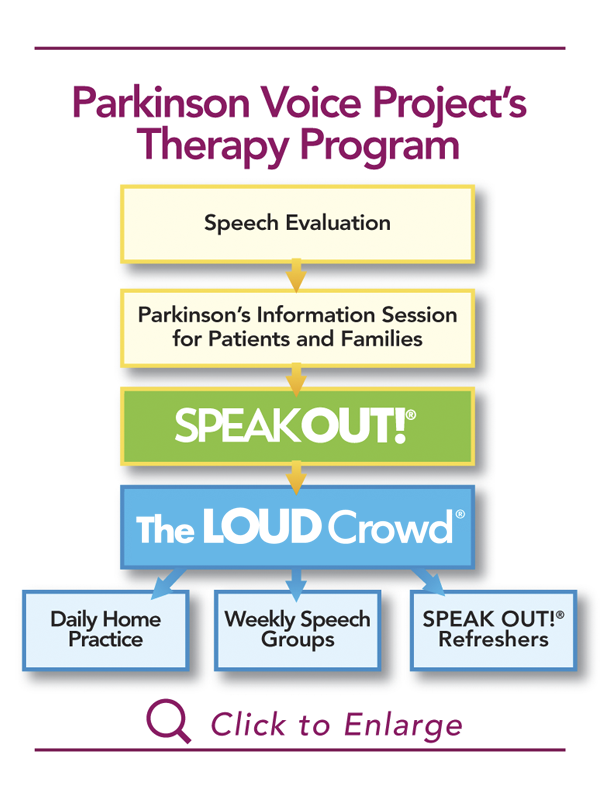 Since not all patients can travel to Parkinson Voice Project for treatment, the organization also offers workshops to train speech-language pathologists from other parts of the world in its SPEAK OUT!® and LOUD Crowd® therapy programs.